The Historical City of Masouleh is part of the Tentative list of Iran in order to qualify for inclusion in the World Heritage List. Masouleh is a town at 1,050m altitude in the Alborz mountains, in the north of Iran near the Caspian Sea. It dates from the 16th century, when the population of Old Masouleh was displaced due to an outbreak of the plague. Some 180 families still live in the ‘new’ village. Masouleh has been on Iran’s Tentative List since 2007, but the explanation provided why it should be considered a WHS is particularly concise: “The traditional and untouched architecture of some houses”. I arrived at Masouleh on May 5th, a religious holiday in Iran. It quickly became clear that many Iranians had selected this mountain village as a destination to celebrate their day off. Long lines of cars were parked alongside the entrance road. Many had ditched their cars even earlier, and were picknicking on the bank of the road. I even noticed that a few women had removed their headscarves, a pinnacle of rebelliousness in the Islamic Republic of Iran. The village only shows itself when you are right in front of it: it consists of yellow or beige coloured houses stacked on top of each other against the steep mountainside. The space is so limited that the roofs of the buildings below serve as roads for the level above. So if you really want to see something here, you have to climb. I started my round from the left, first uphill and then onto the main street joining the thousands of daytrippers. It reminded me of Volendam, a Dutch town fully focused on tourism. You can also dress up in traditional dress and get your picture taken. People were relaxing at the outdoor restaurants, smoking shisha. The area around the old mosque is especially picturesque. I walked all the way to the upper streets of the village. There 'normal' people still live and it is not so commercial. Most of these old houses have decorated circular wooden windows in their adobe façades. Beforehand I had searched long to learn more about the specifics of this site, and couldn’t find more than often repeated clichés. The very thin Bradt Guide gives it a mere 2 sentences, “welcoming residents and stunning nature, despite crowds of young tourists coming up here in groups to smoke qalian (waterpipe) and relax in one of the cafés”. After my return I found a scholarly article called ‘Masouleh: a City a History’, which does a better job. 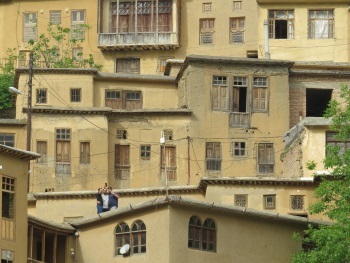 Masouleh is portrayed as a quintessential example of vernacular architecture, adjusted to the particular wet climate of the region with heavy rains, hig humidity, hot summers and cold winters. The houses are made of locally available materials such as wood, stones and adobe. People use the second storey for living quarters, to stay away from the moist ground. Balconies were added to keep the rain from hitting the main building, as well as providing outdoor space in summer. The yellow coating of the buildings is for better visibility during fog. The Iranians state in their Tentative List proposal that Masouleh is comparable to sites such as “Uranamat in Kang, Abyaneh, Proush in France and ...” (I especially like the “…..”, they probably ran out of imagination or time). I haven’t been able to find a French village named Proush, even not among the List of The Most Beautiful Villages of France. Uramanat (right spelling) and Abyaneh are both on Iran’s Tentative List. The Uramanat Villages lie in Irani Kurdistan (cool pic), and Abyaneh is accessible from the road between Qom and Isfahan. Abyaneh looks very similar to Masouleh but with red houses in stead of yellow. It might be the most interesting of the bunch, at least the Iranians think so: “Both villages are multi-leveled and constructed by local materials but Abyaneh has kept its architecture, ceremonies and culture, language, clothing and etc.”. Maybe they can turn these three examples of vernacular architecture into a serial nomination ‘Stepped Villages of North and Central Iran’?